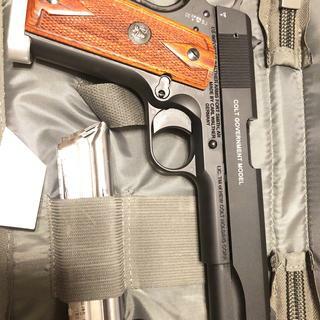 Does this pistol have a threaded barrel? The Colt Government 1911 A1 Pistol 22LR 10 1 5-inch is a firearm that follows all the classic configurations of a top notch weapon. With this as your companion, nobody will mess with you. It is a caliber .22 long rifle with a magazine capacity of 10 rounds. The unloaded overall weight is about 2.25 lbs and it has a overall length of about 8.6 inches. There are 6 grooves and it adopts a blowback operation style. The single action trigger is about 5.5 pounds and there are adjustable and removable rear and front sights. There are also a number of different safety measures incorporated into the design of this firearm, such as the manual thumb safety and the grip safety latch and the disconnecting element.